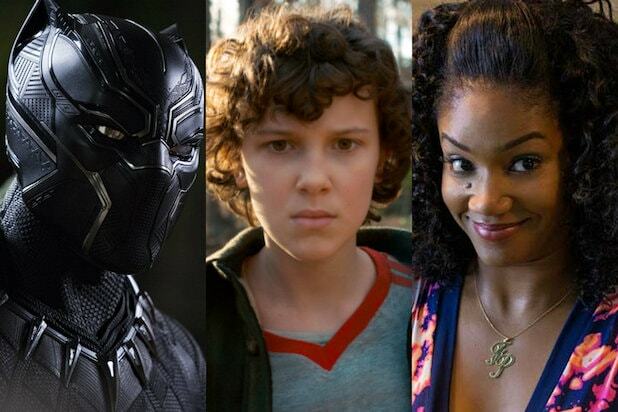 Marvel’s “Black Panther” leads the 2018 MTV Movie & TV Awards nominations with seven nods, including Best Movie and Best Hero and Best Villain for Chadwick Boseman’s King T’Challa and Michael B. Jordan’s Erik Killmonger. On the TV side, Netflix’s second season of “Stranger Things” leads with six nominations, including for Best Show and Best Performance in a Show for Millie Bobby Brown as Eleven. Continuing in last year’s tradition, the awards categories are gender-neutral and include some fan favorites such as Best Kiss, Best On-Screen Team, Scene Stealer and Most Frightened Performance blending moments from movies and TV. Emmy award-winner Joel Gallen will executive produce and direct the 2018 ceremony, returning to the show for the first time since 2006. Gallen had previously produced the awards show for 14 years dating back to 1992. Tiffany Haddish, who is also nominated for her breakout work in “Girls Trip,” will host the MTV Movie & TV Awards, airing on Monday, June 18 at 9 p.m. ET/PT from the Barker Hangar in Los Angeles. See the full list of nominations below, and check out a promo from Haddish here. Marvel has a villain problem. Or until incredibly recently – they HAD a villain problem. A decade’s worth of the most bankable films and memorable heroes Hollywood has to offer, yet they struggled in being able to pit the Avengers against a scene-chewing super villain on par with the Joker, Bane, Doc Ock or Magneto. And no amount of asterisks is going to make those last two part of the MCU. 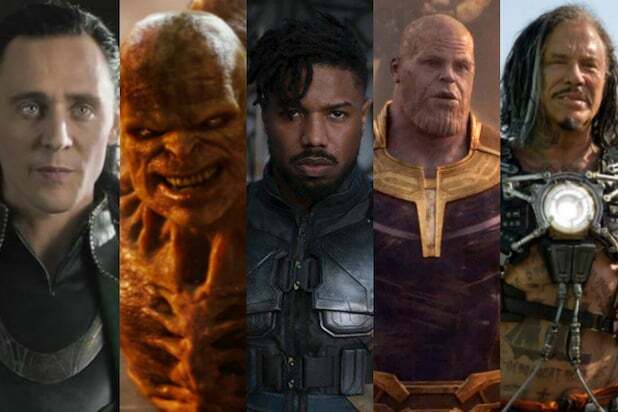 Given that the villains are almost never the best part of a Marvel film, we decided to look back at which ones surprisingly worked, and which ones certainly did not. 22. Ivan Vanko/Whiplash (Mickey Rourke) - "Iron Man 2"
What a mumbling mess. Iron Man has taken down the Hulk, but somehow he struggles with a guy with some extension cord and a pet bird? 21. Malekith (Christopher Eccleston) - "Thor: The Dark World"
Far be it from an elf to be considered evil, this pale skinned dude is known for his bad dialogue and even worse ponytail. 20. Emil Blonsky/The Abomination (Tim Roth) - "The Incredible Hulk"
General Ross is technically the one calling the shots, but Blonsky is the real baddie in “The Incredible Hulk.” Tim Roth plays him with some sweaty, crazy-eyed gusto, but it’s boilerplate gunplay followed by a transformation to another CGI monster who just bashes everything in sight. 19. Ronan (Lee Pace) - "Guardians of the Galaxy"
For a movie as light and breezy as “Guardians of the Galaxy,” it’s a shame its villain is so overly ponderous and heavy handed. Lee Pace’s roaring, boisterous performance looking like an Egyptian God belongs in a different movie entirely. 18. Darren Cross/Yellowjacket (Corey Stoll) - "Ant-Man"
Another scorned CEO driven to evil by copying another hero’s high-tech super suit, Darren Cross is Obadiah Stane with less malevolence. Thankfully, Corey Stoll is almost as likeable as Paul Rudd. 17. Kaecilius (Mads Mikkelsen) - "Doctor Strange"
I’m struck by how little Kaecilius is even in “Doctor Strange.” You could make a case that he’s even the second villain behind the giant dimensional face thing Dormammu. Mads Mikkelsen is a bona-fide Bond villain, and yet his bedazzled fish eyes seem to be doing all the work here. 16. Justin Hammer (Sam Rockwell) - "Iron Man 2"
In another universe, Sam Rockwell might’ve made a great Tony Stark, and he originally auditioned for the part. But as another fast-talking salesman and munitions dealer, he makes a compelling Tony Stark-wannabe and rival, even if he’s more greedy than evil. 15. Aldrich Killian (Guy Pearce) - "Iron Man 3"
Another Tony Stark copycat, Aldrich Killian is evil because he puts the moves on Pepper Potts and is quite literally a firebrand. Though the subplot, backstory that Stark “created” Killian by snubbing him on top of a rooftop is kind of lame. 14. Alexander Pierce (Robert Redford) - "Captain America: The Winter Soldier"
I don’t totally buy that the MCU suddenly turned into “All the President’s Men” just by virtue of casting Robert Redford as Alexander Pierce. He certainly lends "Winter Soldier" gravitas, and he’s a charismatic villain because he’s Redford, but no one’s jumping to call this one of his best performances. If anything, Redford set a bad precedent for superhero movies in having guys in spandex sitting around boardrooms and courthouses debating moral politics. 13. Ghost (Hannah John-Kamen) - "Ant-Man and the Wasp"
Only the second female villain in Marvel history behind Cate Blanchett, Hannah John-Kamen makes the gender-flipped Ghost sympathetic and complex in a way that’s rare in the MCU. In fact, you could put quotation marks around “villain” and point to Sonny Burch as the real baddie of “Ant-Man and the Wasp.” But John-Kamen plays Ghost as always on the verge of becoming fully evil, flirting with kidnapping Scott’s daughter and wholly willing to risk Janet’s life to save her own. She’s good at heart, but you get the sense she could flip without the right guidance from Dr. Bill Foster. 11. Ego (Kurt Russell) - "Guardians of the Galaxy, Vol. 2"
He starts benevolent and visionary, but Ego spreads his seed across the galaxy, then harvests his children in a hunt for the perfect DNA cocktail of his genes and even gives his human wife a tumor. And he can transform into David Hasselhoff on a whim. Pretty evil dude. 10. Ultron (James Spader) - "Avengers: Age of Ultron"
Ultron may be an android, but as voiced by James Spader in his signature quick, dry, and condescending tone, he has more personality and depth than a lot of the villains on this list. He taunts Tony Stark by constantly playing “I Got No Strings on Me” and gives the illusion of grand themes as he goes on about AI and the folly of man. Though I never understood why an unstoppable being that could exist in the Internet would make a physical manifestation of himself that could be so easily defeated. 9. Obadiah Stane/Iron Monger (Jeff Bridges) - "Iron Man"
Every villain Iron Man has faced is a result of someone stealing and manipulating Tony Stark’s tech. No one did that better or more convincingly than Obadiah Stane, who paid off terrorists to kidnap Stark but had a plausible motive as a ruthless corporate suit in doing so. The final battle between Iron Man and Iron Monger is much better than Iron Man fighting swarms of drones. And The Dude himself brings a menacing calm when he’s face to face with Pepper Potts. 8. Johann Schmidt/Red Skull (Hugo Weaving) - "Captain America: The First Avenger"
You can’t go wrong with a raging, deformed, mutant Nazi as your villain. Hugo Weaving brings a cartoonish amount of fuming mad energy to the role, even if he's far from Cap's most formidable foe. 7. Helmut Zemo (Daniel Bruhl) - "Captain America: Civil War"
For a guy with no discernible powers or even a cool costume, Daniel Bruhl goes full Bond villain in his manipulative, mastermind scare tactics. As is the case with Michael Keaton’s Vulture, he’s an ordinary person who has lost so much that you even feel sorry for him as he bares his soul to T’Challa. 6. Bucky Barnes/The Winter Soldier (Sebastian Stan) - "Captain America: The Winter Soldier"
We know he was always good at heart, but Bucky Barnes really looks the part as a great Marvel baddie. He’s mysterious and has an intense death stare, and his punishing, visceral fight scenes with Cap cowering behind his shield are among the most realistic Marvel has staged. 5. Thanos (Josh Brolin) - "Avengers: Infinity War"
In terms of sheer power, he should be at the top of this list. And Josh Brolin's gruff, solemn tone makes him convincingly unstoppable. But as good as the other villains on this list are, none have become a meme in the same way Thanos has, and for that, he'll go down as an all-time great movie villain. 4. Hela (Cate Blanchett) - "Thor: Ragnarok"
Come on Cate Blanchett, if you’re going to be a super-villain, you can’t just show up in what you would’ve already worn to Cannes -- goth antlers, emerald one-piece and all. In a movie not as goofy and fun as Taika Waititi’s, Hela might make for a truly spectacular villain, but she earns points on her character design alone. 3. Adrian Toomes/Vulture (Michael Keaton) - "Spider-Man: Homecoming"
Just when you thought Michael Keaton was done making superhero movies, he joins the “Spider-Man” reboot and puts together this scarily genuine performance of a working class warrior scorned and forgotten by the Avengers heroics. Thor could manhandle him, but against a teen Spidey, its Vulture’s modest proportions of evil and vengeful values that make him feel real. 2. Loki (Tom Hiddleston) - "The Avengers," "Thor"
I don’t have a fangirl-ish affinity for Tom Hiddleston’s Loki like most people do, but his playful and mischievous good guy/bad guy routine with Thor and the other Avengers have made him a Marvel mainstay for a reason. 1. Erik Killmonger (Michael B. Jordan) - "Black Panther"
As played by Michael B. Jordan with a menacing swagger, Killmonger has fashion sense, sexuality, confidence, and he makes you believe he’s RIGHT. His tragic backstory and honest Oakland upbringing make him empathetic, but it’s his blackness that speaks volumes. The scene where he’s introduced, with Killmonger stealing an ancient hatchet and confronting the white clerk in the museum, might be Marvel’s finest moment period, and is by far the best villain Marvel has had to offer. Where does “Ant-Man and the Wasp” baddie Ghost rank?